I received an email from one of my couples from years past and it made my day. 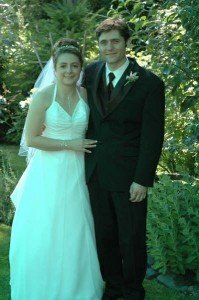 In June 2005, I had the pleasure of marrying Adam and Marcy at an intimate home wedding near my home on Bainbridge Island. Marcy sent me this email last month, updating me on the past years and I am so thrilled for her happiness with Adam and their three daughters, Hanna, Samantha and Emily. Adam and Marcy – Thank you for reminding me why I do this work. I wish you much love and happiness and I’m smiling at your updated photos!